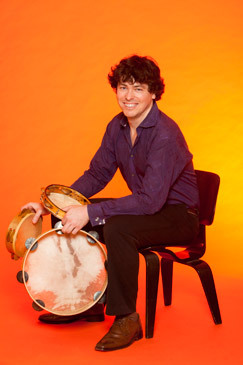 Brian O’Neill, Boston percussionist, drummer, & musician: Jazz, latin, world, orchestral, exotica, mexican son, esquivel. Orange press photos by Robin Holland. 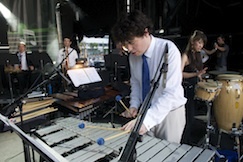 Brian O’Neill is a versatile multi-percussionist, drummer and composer based in Boston who has performed at The Montreal Jazz Festival, The Kennedy Center, and Carnegie Hall among others. 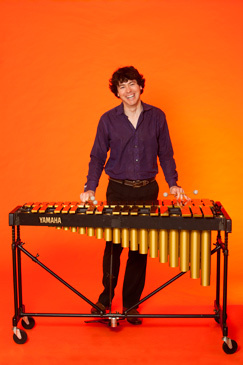 A “percussion master and musical polymath” (Boston Phoenix), Brian performs regularly in a wide variety of musical contexts including jazz, classical, world music, and theatre. In addition to freelancing, he leads Mr. Ho’s Orchestrotica, which performs original global jazz and chamber music as well as the lost music of Esquivel (“deliciously entertaining”Wall Street Journal). Brian has also performed with Portland Symphony, Albany Symphony, Boston Modern Orchestra, Kristin Chenoweth, Donna Summer, the national tour of Motown the Musical, and is regularly heard at North Shore Music Theatre. Follow Brian at crashandboom.com or on Twitter/Instagram (@orchestrotica).